I am one of the many who watched Nicolas Winding Refn's 1996 Danish version of Pusher years ago and was blown away. It’s one of those films that transcends its dirty kitchen sink station and is not about big ideas or concepts it’s about people, relationships and personalities granted Pusher would not be a tense crime thriller if the humanity was not governed by the dynamics of the seedy underworld microcosm it inhabits and this is something that Refn uses to masterful effect in Pusher. Pusher is more than a cult classic it introduces us to a world that needs exploring and Luis Prieto’s original remake of Pusher gives us the opportunity to revisit that world again. I really enjoyed Pusher - as can be seen by the 4 star rating displayed on the UK Pusher quad poster below. For the record I actually prefer the earlier UK one sheet poster at the bottom of the page which hints at a more anonymous and darker tone, more in line with Scorsese’s Taxi Driver which the poster tips its hat to. The original Pusher may follow one of the staple of crime thrillers - a man with a deadline feels the pressure as the net closes in on him and he becomes more desperate - the exception here is that with Pusher the protagonist - Frank (Kim Bodnia) is a criminal, a small time drug dealer who manages to just get by. These days you can’t browse a DVD rental store (ha, ha DVD rental store, remember those?) without coming across a slew of drug dealer under pressure films, but Pusher was the first and you can see its influence in Guy Ritchie’s Lock, Stock and Two Smoking Barrels which blew up the genre. Frank has not illusions of being a mastermind or the clichéd one more big score, or sailing off into the sun-set with his ill gotten nest egg, at his core Frank is just a man who does what he does to get by and knows no other way and he doesn’t seem to have any plans for fixing what ain’t broken. Via Frank we are introduced to the world of Pusher and his network of contacts his long suffering girlfriend Vic (Laura Drasbæk); his side kick Tonny (Mads Mikkelsen), his clients and the local Godfather, Croatian gangster Milo (Zlatko Burić). The elusive film magic that so many chase and Pusher has in abundance is that Refn transports you to another world and a different culture, an exotic world filled with engaging characters that we can relate to but don’t quite reflect us and they live in a very recognisable world but this is the world that we as tourists will not see and it is so different from our own that it may as well be Blade Runner’s L.A. of 2019 or Avatar’s Pandorum. They speak a different language, live by a different set of rules and you are never quite sure what will happen next in this dangerous universe. A large part of what makes Pusher so wonderful is that the performances of the cast are incredibly engaging and over the week Frank finds himself increasingly in deeper water as his desperate plays don’t quite pan out as he tries to keep a couple of steps ahead of rivals, the police and Milo. And despite his flaws you can’t help but sympathise with Frank and slowly move from wishing him a better life to just hoping that he manages to survive the week. Talking about engaging characters; Zlatko Burić steals the show as Milo he is charismatic but that is put away when it time to go to work and the heavy duty tools come out. Again, as with most of the characters you get a real sense that as deadly as Milo is as the head of a brutal gang he doesn't really want to be doing this he is a sensible businessman but won’t hesitate at the drop of a hat to torture someone. Despite Pusher being Nicolas Winding Refn’s debut film he controls the audience and keeps you captivated like an old master of suspense, certainly not easy with a small film shot with hand held cameras in small, dark & dingy real world locations. And it feels part cinema vérité style documentary as he draws you into a very credible and grimy Copenhagen criminal underworld and part exploration of universal social issues. Clearly Pusher is the work of a talent that would be going places. 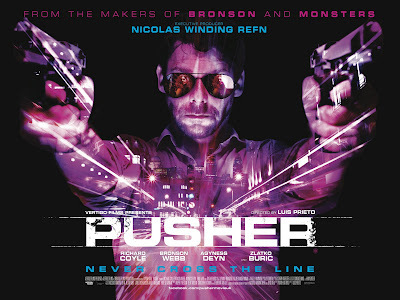 I am not the only one who thought Pusher was pretty good, it kicked of Nicolas Winding Refn's career and he went on to make two more films in the internationally successful Pusher trilogy. Kim Bodnia continued his successful acting career, Zlatko Burić won a the Danish equivalent of an Oscar for his performance and has a army of fans and Mads Mikkelsen has gone on to great acclaim and worked with Refn again on Valhalla Rising an incredible film embodying a bold 70s visual aesthetic and in my opinion Refn's best film to date. In case you thought Pusher was a fluke or once off Refn continued to surprise with the remaining two films of the Pusher trilogy, when rather than obey the rules of sequels which we have come to expect he took us back to the world of Pusher but focused on different characters within its world. In Pusher II: With Blood on My Hands we follow Frank’side kick Tonny (Mads Mikkelsen) and see what has become of him and the path he chooses and in Pusher III: I'm the Angel of Death we get to delve into Milo’s (Zlatko Burić) life and the pressures he is under further cementing Zlatko Burić’s cult status. Such is Pusher’s influence and status amongst film lovers that it got a Bollywood remake back in 2010, which looks to follow the story closely as well as the lo-fi documentary style photography. 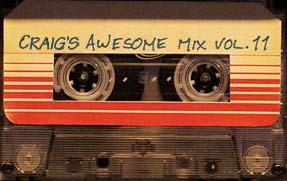 All of which brings us to 2012 and Luis Prieto’s Pusher. Prieto who transports Pusher to London, because in Prieto’s own words - London is one of the most exciting cities in the world right now, full of clubs, full of music, full of drugs and it felt like the right place to make Pusher. An East London dealer (Richard Coyle) grows increasingly desperate after a botched get rich quick scam leaves him with a large debt to repay to a ruthless drug lord. 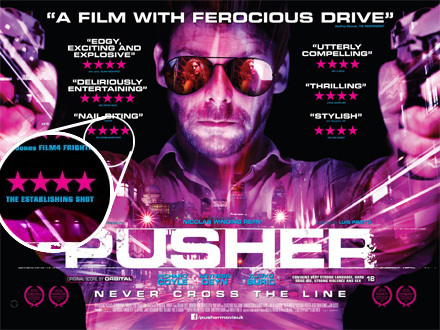 Fast-paced, visually striking, witty and with some of Britain’s finest acting talents, Pusher will have you gripped from beginning to end. I gave Prieto’s Pusher 4 stars, and whilst I don’t use a star system it was easy to apply a star for each stand out bit of Pusher. I think the original 1996 Pusher trilogy may have difficulty connecting with a broader new audience as it is a fairly low budget dark affair and post Drive audiences want something more glossy and familiar – so I can see why the time is right for an English update to Pusher bringing Refn’s characters into the new world. I wish that more London landmarks were visible in Pusher but that would be contrary to the underground atmosphere that Prieto is creating. As an example there is a prime opportunity to have used the glorious lit up Battersea Power Station in the background when Frank (Richard Doyle) visits one of his clients Fitz (Paul Kaye) at his Viridian, Battersea apartment instead you can barely make out the ghost of the Power station in the background of course you could read into this that the people in Pusher are more concerned and focused on them selves more than the world around them and are always inward facing and this is certainly prevalent in Frank’s point of view throughout the film. Spot Director Neil Maskell's cameo in Pusher in the clip below. Richard Coyle is a revelation as the driven, relentless and intense Frank. The original Frank was slightly subdued and ambiguous, those qualities gave him an vulnerable every man feel that works well as you empathise with him as the net draws in and he seems to be grabbing at straws but Richard Coyle makes Frank his own and is something to behold. There is no ambiguity to Coyle’s Frank, he is a principled sharp and smart business man with his mind on his money and you get the feeling that he is clever enough to work his way out of any situation which brings the tension and frustration when his world spirals out of control and he is forced to break his own rules. Even though I have seen a good few of his roles (The Libertine, Gunpowder, Treason & Plot, Going Postal, Prince of Persia: The Sands of Time, Franklyn) I’m not overly familiar with Coyle’s numerous works on stage, TV or film for which he has received much critical acclaim for, and as with many he will always be Jeff the lovable buffoon from Coupling for me, a role he left for fear of being typecast and wanting to grow. But his 2011 performance in Madonna’s W.E. seemed to signal a change in the level of his intensity he was willing to bring to screen when he played William Winthrop an abusive husband, this intensity comes to fruition with Pusher. Richard Coyle’s Frank swings from nice guy to seething menace very easily and it becomes clear that he is not someone you want to mess around with, their is something scarily intense about his performance and I’m looking forward to seeing Coyle in a full fledged villain role. For her debut feature film Agyness Deyn brings both vulnerability, confidence and an air of tragedy to her Flo and you want to see more of her. My only criticism of her character would be that, unlike Pusher's original Vic, she is less morally ambiguous and such an attractive presence that I couldn't help wonder why on earth Frank is not doing everything he can to hold onto her and ensure that they ride off into the sunset together, she is clearly waiting on his words and is too good for him, the first hint that Frank is not as smart as he thinks and again reinforcing the mindset of the selfish people who inhabit the world of Pusher. Something I loved about the original Pusher is the bond between Kim Bodnia's Frank and his sidekick Mads Mikkelsen's Tonny. It’s juvenile and playful and does bring a sense of boys playing gangster showing a vulnerable human side to these criminal characters and they seem to be trapped in a way of life rather than wanting to be in it. There is less of this dynamic in Prieto’s Pusher as much of it is driven by Coyle’s Frank who is a lot more intense & brutal and although you feel his frustration as his world starts closing in on him you don’t really get to see what is under his hard edge. But there is a completely bonkers and out of place scene early on where Bronson Webb’s Tony and Coyle’s Frank have to take on the world together and I couldn't help but chuckle along with them at how wrong and how much fun the scene is. Third Star – The legend of Zlatko Burić and any scene that he is in will be great. Look in all honesty Zlatko Burić doesn’t have to do anything he could have just stood there and I would have been happy but Zlatko Burić brings the same incredibly charismatic and engaging performances as with the previous Pusher films. Bringing Burić in cleverly ties Prieto’s Pusher to the existing trilogy. And too be honest I couldn't imagine anyone else in the role - everything about his performance is authentic, his timing, his delivery and his ambiguity makes him compelling and entertaining. Milo in one of those roles that the actor playing the character is so tied into that it is hard to tell where they begin and the performance ends like Schwarzenegger’s Terminator or Stallone’ Rocky or De Niro’s Travis Bickle. He delivers a great performance because he is Milo. 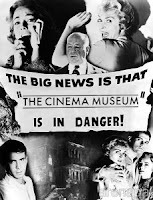 It has to be daunting to remake a much loved cult classic especially from a Director that is as revered and made precious by his fan base as Nicolas Winding Refn and it may have been a bit unfair to include bits about the original Pusher in my thoughts, especially since Prieto asked his team not to watch the original before embarking on the project. I am hoping that new audiences can engage with the exciting fun vision of Pusher but some may struggle to with the material as Pusher has been copied many times since in some form other, thankfully the performances across the board and the ambiance Luis Prieto creates should be enough to welcome newcomers to the dark visionary world of Pusher.